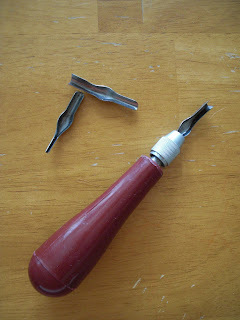 Obsessively Stitching: Make Your Own Rubber Stamps! 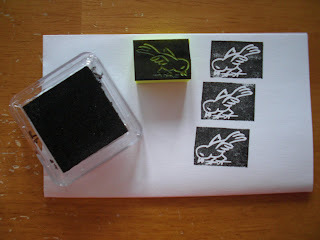 Today I will show you how to make a super simple rubber stamp out of dollar store items! 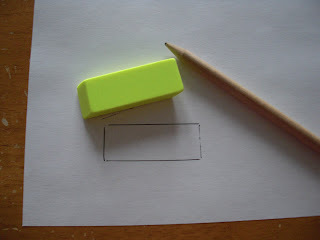 Step One: Trace the size of your eraser on a piece of paper. Step Two: Draw a little picture. 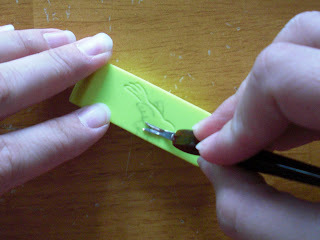 No need to flip the image -- Draw it just as you want your stamp to print. Not an artist? Print out a clipart picture and trace it with your pencil. Step Three: Cut out your picture, place it face down on your eraser, and rub. Your picture should transfer very easily. 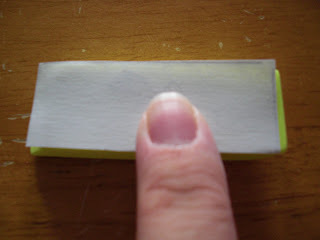 Step Four: Take your cuticle remover and carve exactly along your lines. This might take a little practice. 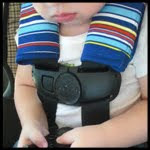 Remember to use one continuous motion -- don't stop in the middle of a line! -- or your line will get a little choppy. If you mess up, just flip your eraser and start over on the other side. 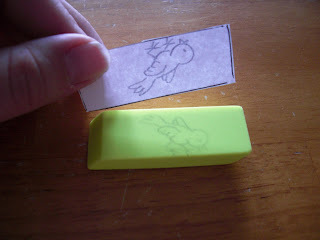 I cut my eraser down to fit my image better. Step Five: Ink it up and stamp away! Here's another one I made, just goofing around. If you don't have a stamp pad, use markers! I used a highlighter to print this one. 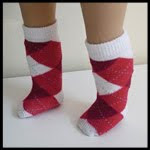 You can make these as simple or as detailed as you like. 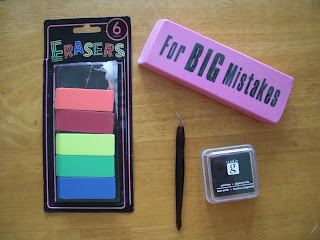 I haven't used my big eraser yet -- I still haven't come up with an image idea that I love. 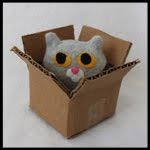 It would be fun to take a simple image your child has drawn, shrink it to size in Photoshop, and create a stamp! Cute little tute!!! 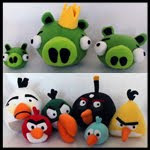 I want to make one with my name on it. Maybe one for my kids too! 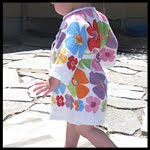 I featured this on somedaycrafts.blogspot.com. Grab my "featured" button. 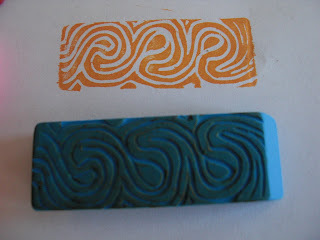 I really like linocutting/stamp carving!! So cute! This will be featured on ym blog on Thursday! I love your bird stamp! MAN...now you tell me. i needed a little stamp to put on the back of my price tags and i went out and bought one YESTERDAY!!! It was only a few bucks, but still...i might have to take it back. awesome. so much better than using a potato. er, that's the extent of my stamping skills. 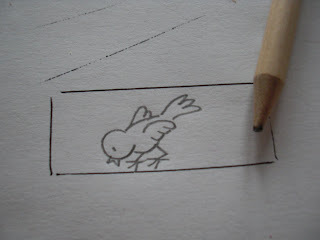 I will be making us new letterboxing stamps using this method. thanks! Fabulous! I have so many ideas running through my head now...... Thanks for sharing the tute! Oh wow, it's been years since I've used a lino cutter. 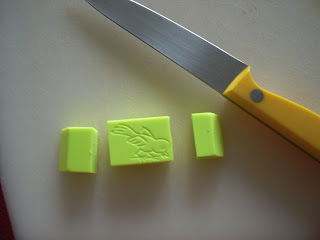 Making stamps really was a lot of fun. 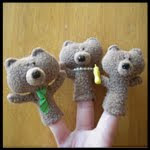 Hm ... now I really want one! I had a manicure set sitting around that I would never use other than the small scissors for embroidery but now you have given me a use for the metal torture device that was in there too! Thanks!! Such a great idea. I found your post today and linked it to my site. Hopefully people will come and find your great tutorial. Thanks for the inspiration! Hello! I found your clever tutorial through Dollar Store Crafts. I'm just wondering if it matters what kind of eraser you use? Moeyness, Look for one that is not too soft, or crumbly, and you should be good to go! thank you thank you thank you! i have been looking for a tractor stamp, but haven't found one that i liked and i wondered how to make my own. this is perfect timing!